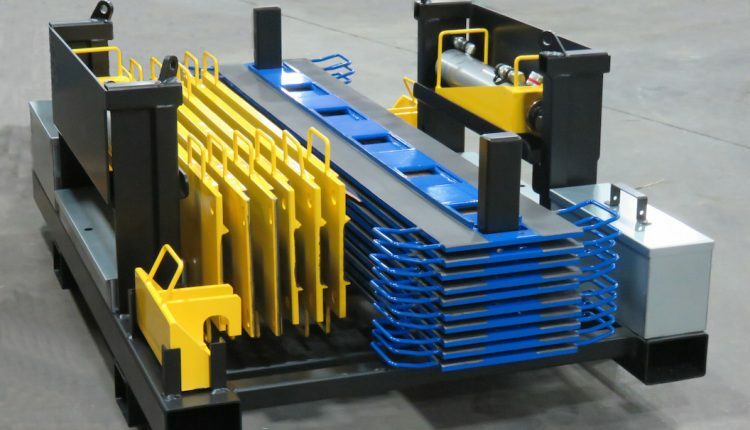 Canadian manufacturer Hydra-Slide has launched its third low profile hydraulic skidding system—the LP350—that has already proved its value in two applications in the UK, where international sales partner Rapid Response Solutions (RRS) recently took delivery of the first unit off the production line. The LP350, capable of pushing loads up to 350 tons (310 tonnes), represents continued evolution of the low profile range that includes the XLP150 and LP400 systems. Different to their heavy track counterparts, the products are completely hand-portable and low profiles suit them to use in areas with limited access or clearance. A standout component of the LP350 is the graphite-steel slide surface, also a feature of the heavy track range, replacing the ultra-high-molecular-weight polyethylene (UHMW) pads that were subject to wear and vulnerable to extreme weather conditions. Elimination of the plastic pads has also decreased the profile by another 0.5 inches. Lifting, transport and storage specialist RRS used the LP350 for two marine and industrial projects shortly after taking delivery of the equipment. Having moved an approx. 20-tonne engine and associated components out of a hangar onto the flight deck of a naval ship, it then removed a 25-tonne gearbox from within a confined plant-room. Hydra-Slide’s Smith added that LP400 customers will still be able to order replacement components or additional parts, as required.